Date Added: Friday 13 July, 2018 by Kiara K.
WOW, Very classy, very cool, very well done! _3 Thankyou SOOOOOOO much!!! Date Added: Wednesday 07 February, 2018 by Shawn P.
Date Added: Friday 05 March, 2010 by Hector C.
Date Added: Wednesday 28 October, 2009 by Phil M.
5 Stars here. Indy was kind enough to work with me over the construction process on proper alterations and custom modifications to truly bring this coat back to life to replicate the screen worn version. Instructions were followed properly and very accurately and was shipped to me in a jaw dropping suspense of satisfaction, without a doubt! Great work, thank you :).. Date Added: Wednesday 12 August, 2009 by chris w.
i would like to give this coat 7 stars outta 5! i got the coat today after ordering it just alittle over 2 weeks ago. after putting on the rest of the outfit ordered through Magnoli Clothiers i can honestly say its scary how the coat replicates Heath Ledger's in the Dark Knight!!! i love all the features, the 4 panels and 3 vents, the flared cuffs and even the way the lapels are folded. 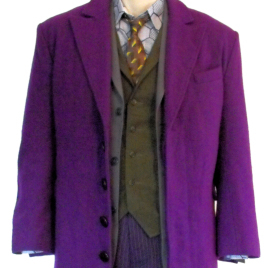 but having all these items tailored to my deminsions are what really make my completed joker suit stand out from all the others!!! thank you Indy for all the great work!!!.. Date Added: Friday 07 August, 2009 by Aaron S.
it's a very fine coat with great materials but the seams are off. the front and back panels of the real coat are astonishingly large and very overlapped. the back panels of the real coat are very narrow tailored from the upper back to the lower back. i know with the propper pictures this coat can be altered to be 100% screen accurate. anyone who wants pictures with an explanation feel free to message me. i spent quite awhile breaking the coat down watching the movie frame by frame. 100% screen accuracy can be done. e-mail sponger1990@aol.com if you want to know more..